A.D. King Foundation is a non-violent conflict resolution entity formed to revolutionize the mind set, attitude and behavior that promote violence and war with non-violent principles and methods as the preferred choice of conflict resolution throughout the world. Rev. A.D. King believed that war is never the answer and non-violence means will always overcome all means necessary. He believed that building bridges of mutual understanding, cooperation, goodwill, respect and love for humanity across gender, race, religion and culture will achieve peaceful coexistence and bring us closer to building a peaceful loving and gracious beloved community of humanity. Rev. A.D. King never sought fame or popularity but he was a true soldier of great transformation through nonviolent social change, commitment to serve by leading the poor people’s campaign and dedication to the movement for equity, freedom and justice for all. He paid dearly with his life for preaching love as an instrument of change not war. Through the establishment of www.adkingfoundation.com the foundation can promote the teaching of Rev. A.D. king's methods of nonviolence and conflict resolution throughout the world. The foundation will become a resource for conflict resolution, building bridges of mutual understanding and creating the beloved community in every culture across the globe. To achieve these noble goals the foundation will establish e-commerce as well as electronic communication as a global initiative through www.adkingfoundation.com. AD King Foundation was established to raise funds to construct AD King Memorial in Birmingham Alabama and Louisville Kentucky . It will pay tribute to Daddy King, AD King, ML King and all the unknown heroes and great women of the civil rights movement. Naomi Barbara King, widow of AD King made a commitment to bring to lime light the contributions and legacy of her late husband Dr. Rev. Alfed Daniel Williams King. Dr. Rev. Babs Olusegun Onabanjo, one of the originators of the idea, was commissioned to develop and manage the project in January 2007. The documentary “AD King: Brother To The Dreamer: Behold The Dream” was initiated in May 2007. In January 2008, Naomi Barbara King received the SCLC 2008 Rosa Park Freedom Award. A.D. King Foundation Inc. was formed in May 2008. The company officers are Mrs. Naomi King: Founder & Chair Emeritus Board of Directors: Dr. Babs Onabanjo President & Chief Executive Officer: Dr. Alveda King, Chair, Board of Directors, Rev. Derek King Director, Rev. Dr. Paul Albert Brinson Director, Jarret Ellis, Director. A.D. King Foundation is a non-profit organization, dedicated to highlighting Rev. 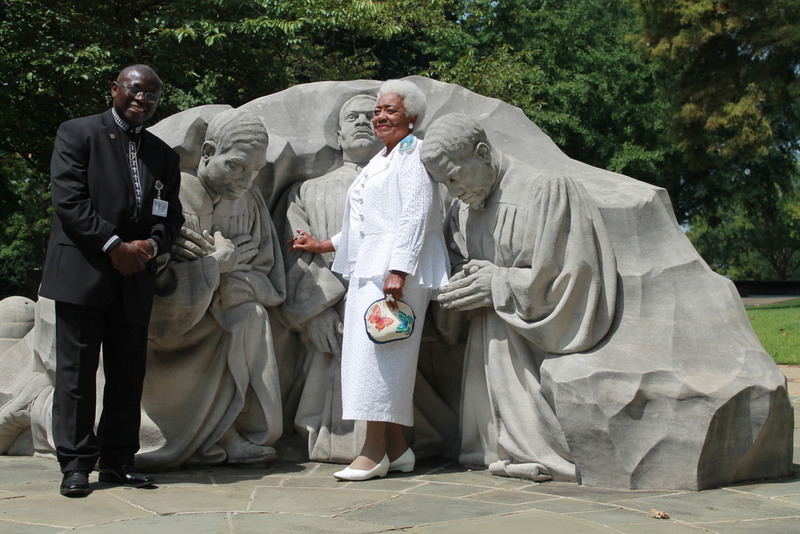 A.D. Williams King’s enormous contributions to the civil rights movement. An extra-ordinary life of dedication, service, unconditional support for his brother, the movement, America and the world. Rev. A.D. Williams King was a renowned pastor, a philosopher and a formidable and significant activist. The Foundation is intended to educate the public about the real history of the civil rights movements, the strategies employed, the timing, the circumstances and the role of the legends of the movement. Rev. A. D. King,was one of the main strategists of the movement in Atlanta, Birmingham, Selma and Louisville and many other cities in which the movement was involved, Rev. A. D. King was the confidant and a blood brother to the dreamer Dr. Martin Luther. King Jr. Rev. A.D. King never recovered from his brother’s loss. More importantly the movement was a spiritual movement. To God be the glory. The A. D. King Foundation is committed to transforming the culture with positive media messages that equip our youth and young adults for success in the 21st century. Through our mentoring and internship relationships with our youth and young adult population, we teach them to create, own, produce and market television pilots, positive imaging, positive music and lyrics, poetry, You Tube projects, Internet blogging, book publications, radio shows, Internet talk shows and reality shows, and other creative projects. Working with the finest professionals in the various industries outlined above, we provide attainable and sustainable tools for success for our youth and young adults. Entrepreneurship, good citizenship, global awareness and successful interaction with other cultures, positive purpose and beneficial quality of life are major themes of this initiative. "A threat to justice anywhere is a threat to justice everywhere" and building a beloved community is a glorious task that must be done. Rev A. D. King (brother to Rev. Martin Luther King Jr.) dedicated his life to building a beloved community. He was also committed to the ideals of non-violent social change and direct action as a means of effecting change. Rev. A. D. King's house was bombed in Birmingham, May 11, 1963 as a result of his activism in Ensley and Birmingham Alabama. Rev. A.D. King was one of the main strategists of the Selma demonstration. According to records of the SCLC archive at the King Center: " It is widely held that the Birmingham demonstrations led directly to the passage of the Civil Rights Act of 1964 and that the Selma Campaign compelled the U.S. Congress to enact the Voting Rights Act of 1965". Rev. A.D. King led the Open Housing Campaign in Louisville Kentucky which became a national law- The Open Housing Act - 1968. He was a giant and an icon of the Civil Rights Movement in its own right. About The Documentary: Rev. A.D. King: Brother To The Dreamer: " Behold The Dream". "The story is compelling, relevant, valuable and practical. A legend of immense proportion as one of the greatest Civil Rights Activists of his time in his own right".